Las Vegas is no stranger to Culinary Stars as many of the World’s Best Chefs have venues up and down the famed Las Vegas strip. Food & Wine Magazine brought in even more of these Master Chefs and Top Chef Contestants to the beautiful ARIA Resort and Casino for the second annual All-Star Weekend hosted by Bravo’s own Top Chef Judge Gail Simmons and Food & Wine Magazine’s Anthony Giglio for a weekend that would make any “foodie” salivate with excitement . To get this three day weekend started right , an” A” list of Renowned Chefs joined the all-star lineup from ARIA and Bellagio such as Jean-Georges Vongerichten, Masa Takayama, Shawn McClain and Julian Serrano and restaurateur Sirio Maccioni on the Red Carpet side by side with Bravo TV’s Top Chef alums Stephanie Izard, Hosea Rosenberg, Angelo Sosa and Sam Talbot. Where else but Las Vegas could guests in attendance see this many of their culinary heroes all side by side. 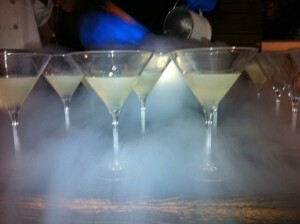 As the Red Carpet cooled off, Chefs and Guests alike headed to ARIA’s chic View Bar to get the party started. With that, the party began with passed hors d’oeuvres from a world class line up of cuisine from ARIA’s own line up of All-Star Chefs including Julian Serrano’s Lobster-Pineapple Skewers, Sage’s Foie Gras Brulee and BARMASA’s Seafood Ceviche. 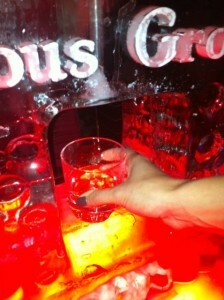 This was just the beginning and the kick off night was gaining momentum. With an event like this, it could never end too soon. 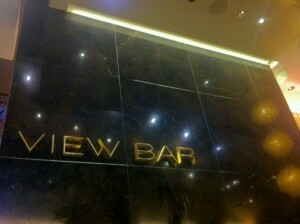 After sampling some mouthwatering dishes in the View Bar it was time for Dessert and a late night cocktail. UNION Restaurant & Lounge was the set for All-Star Nightcap. Decadent desserts such as Frozen Coconut Bites and Chocolate Cremeux from Top Chef Just DessertsSeason One winner Yigit Pura were enjoyed as guests took advantage of the intimate setting to mingle with some of the best chefs into the early morning hours. Looking ahead to the following day with two luncheons and the All-Star tasting, one could count on this weekend as a memorable culinary journey. The second day of this All-Star event offered up some tantalizing choices. Chef Shawn McClain and Top Chef Season 4 Winner Stephanie Izard teamed up in the Kitchen and Anthony Giglio hosted “A New American Lunch” at Sage in ARIA or one could join Gail Simmons and Director of Wine, Jason Smith, for a “Luxe Lunch” at Tuscany Kitchen in Bellagio for a mid day culinary experience . Sage in ARIA was our choice for lunch. The dark, richly designed venue delighted guests as they were welcomed by Chef Shawn McClain himself and refreshing Champagne cocktails at the reception. 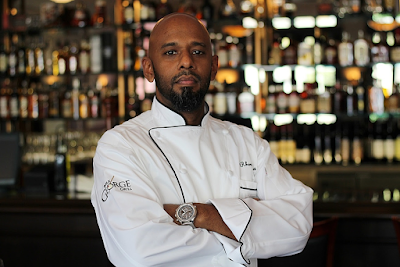 Having dined at Sage in the past, we took our seats with great anticipation of what we were going to experience. Chef Shawn McClain and Stephanie Izard alternated courses paired with wine or a cocktail to our palates delight. Stephanie’s Third Course of Seared Diver Scallops with Smoked Goat XO/Winter Squash/Shiitake Mushrooms was one of the best Scallops we have had in quite a while. The last cocktail, Germain-Robin, Absinthe / California got everyone in the right mood for the All-Star tasting under the stars at ARIA’s luxurious pool. ARIA’s pool glistened in the moonlight as renowned chefs Julian Serrano, Masa Takayama, Michael Mina, Shawn McClain, Jean-Georges Vongerichten, Jean-Philippe Maury and Three Star Michelin Chef Pierre Gagnaire served mouthwatering delights from their world-class restaurants. 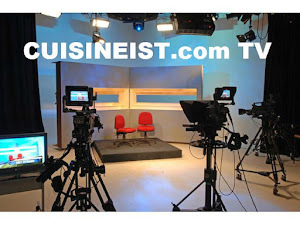 Bravo TV’s Top Chefalums Hosea Rosenberg, Sam Talbot, Stephanie Izard, Yigit Pura and Angelo Sosa also were eager to impress the guests as they stood shoulder to shoulder with The Masters. The always Gracious Host Gail Simmons was excited as she addressed the guests, “I can honestly say that I’m so excited to be back here in Las Vegas at the beautiful and luxurious ARIA & Bellagio Resorts.” “Eat, drink and live it up! 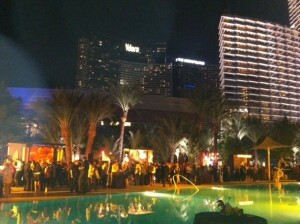 “ Guest’s did just that as they strolled poolside being served by the All-Stars themselves. Walking around the pool with cocktail or wine, guests had a variety of culinary experiences to enjoy. Glazed Pork Belly from Shawn McClain’s Sage and Goat and Peanut Thai-style Stew that stood out as guests favorites served byTop Chef Season Four Winner Stephanie Izard. Michael Mina offered his signature Shrimp & Grits Skewers and just a fork full away, Top Chef cheftestant Sam Talbot provided Fish Tacos with avocado and lime. Of course our sweet tooth was satisfied by creations being served by Top Chef Just Desserts Season One winner Yigit Pura who was all smiles about his latest venture set to open in San Francisco in May 2012. There were dishes for anyone’s palate including BARMASA, Sirio Ristorante and Jean Georges Steakhouse, which served Braised Short Ribs, Alaskan King Crab & Leek Salad and Truffle Cheese Fritters respectively. ARIA’s Pool provided a relaxed atmosphere with its tropical vive and lush landscape. The Starlit sky, the decadent Food, and easy listening tracks by DJ R.O.B. provided an enjoyable experience for all that attended. An event like this has to have a “period” at the end of”foodtastic”weekend. A Champagne & Caviar Brunch hosted by Food & Wine Magazine’s Anthony Giglio at Jasmine over looking Bellagio Fountains was not just a “period” at the end of the weekend, but an “exclamation point”. The ARIA Resort provides many amenities anyone could wish for during their stay. 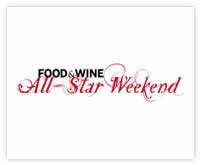 Putting this all together in Las Vegas, with gracious and accessible hosts, makes Food & Wine All-Star Weekend a “destination “weekend that guests will return to year after year. As a journalist it is always “fun” to experience a birth of a restaurant, resort, winery or a wine that is new to the region or even the country. 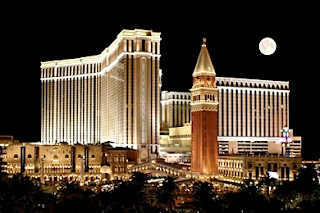 Recently a new line of wines arrived in Las Vegas and all we can say is BRAVO! Italy, of course is no newcomer to wine as their winemakeing skills and talents have been perfected from antiquity. Guardia 33 is a wonderful line of wines that has arrived in Las Vegas and making a big splash in this land of All-Star Chefs and Master Sommeliers. 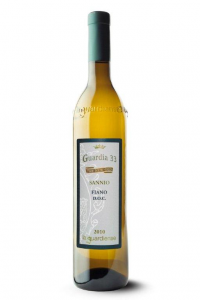 The roots of Guardia 33 start in the quaint Village of Guardia Sanframondi in the region of Campania. Campania is located in southern Italy on the Peninsula with the Tyrrhenian Sea just to the west. It is also home to La Guardiense farming cooperative, formed by 33 associates in 1960, with a plan to help the local economy through combined efforts of research, development, production, shipping and marketing. It is now over 50 years old and has grown to over 1000 members. 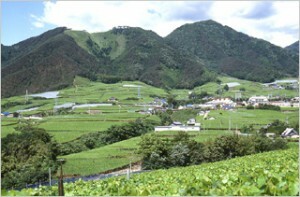 The Cooperative’s focus is all indigenous grapes. They have exported these new wines to the United States with great fanfare and have impressed many. All are DOC and labeled under the brand “Guardia 33”, meaning “guard 33”, named after the 33 original founders of the cooperative. The four white wines really stand out on a wine list as they are very interesting to say the least. 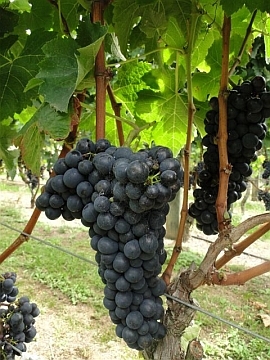 All are members of the Greco family of grapes and now, with DNA testing, oenologists believe them to have been the parent of most of the white varietals in Italy. Fiano, Sannio DOC is much more intense. On the nose there are light aromas of all -spice, green herbs, almonds and pine nuts. The palate confirms the nose with a creamy mouth feel and nice balanced acidity on the finish. Fiano Apiano On the noise shows aromas of Almond, Pine nuts and citrus as well. All of these are confirmed on the palate with a nice long bright finish. Falanghina, Guardiolo DOC, Is a nice refreshing wine. Just like the other wines previous to this one there are notes of herbs , green pepper and a slight nuttiness on the palate with very light citrus notes on the finish. The final white wine was a real treat and is one that only a few Americans have tried. Coda di Volpe, Sannio DOC, “fox’s tail”. In the glass this very special wine was straw colored and the nose and palate exploded with white fruit and citrus notes and finished with light well balanced acidity. Having enjoyed the white wines immensely it was time to “bump” it up, and that we surely did as we tried the first of the red wines. First off, we have to say that both were amazing and caught our attention right away. 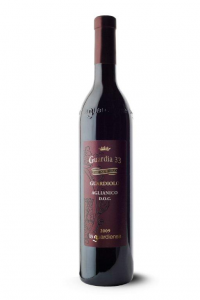 Aglianico, Guardiolo DOC is aged stainless steel. 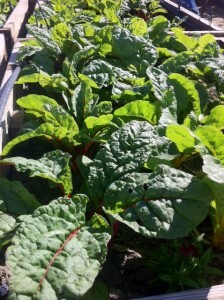 Its name is thought to come from the Roman term “ellenico” (Hellenic) used for the Greeks, who brought it to Campania. For a red wine that was aged in stainless steel it was rather complex and reminded us of a Barolo in many ways. Old world signature earth notes come through on the nose and on the palate with lingering notes of smoke , cherry , raspberry and other red fruits that all combine with a long finish and smooth tannins. Aglianico, Rosso Riserva, Guardiolo DOC was our final wine and well worth the wait. As a Riserva , the grapes are chosen from the best vineyards and aged for two years in small oak casks. The lovely blend of 80% Sangiovese/20 % Aglianico makes this wine unique and classic all in the same glass. The blend is not a common blend and using the Sangiovese gives this wine a lot of complexity. To really experience a wine properly you need to pair it with food. Being that these wines come from a coastal region, what a better place to take these wines a out and put them to the test than with a restaurant who’s Chef knows how to prepare a variety of dishes using these unusual but tasty wines. 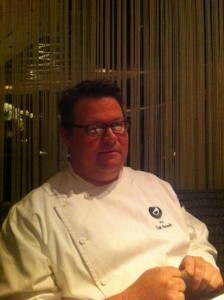 Executive Chef Tim Horrock now at the very famous KOI in the Planet Hollywood Resort was up to the challenge. The menu at Koi Las Vegas is inspired by traditional Japanese dishes enhanced with modern California accents and influences throughout Asia and around the globe. The culinary experience at Koi in Los Angeles, New York and Bangkok has been lauded in several national food and wine publications. 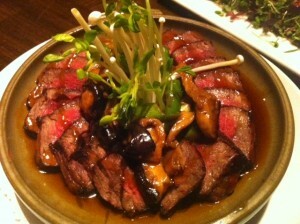 There could not be a better Chef and restaurant than Koi to sample these wines with creative dishes. Chef Tim was excited to get started. He explained that his philosophy has always been “to do as little as possible to the dish to bring out the best in the dish and the wine. These light bodied Red wines allow me to create a variety of choices”. With nice wines and anticipation of great creations we put ourselves in the very capable hands of Melody Pender and her staff. The Fiano was paired first as Chef Tim joined us at table. The Hamachi fusion, soy yuzu, truffle essence paired nicely as we expected with flavors from the sea and land lending to a perfect marriage of food and wine. 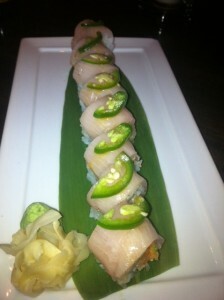 The second dish of a Hot Hamachi roll, inside yellowtail tartare, top sliced yellow tail, jalapeno put the wine to its first test with some “heat”. 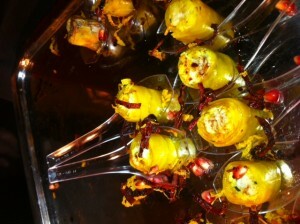 It passed with Flying colors with the acidity in the wine balancing perfectly with the spice in the dish. Seared Tuna, jalapeno and crisp garlic chips provided a chance to see these wines from the coast paired with a fish and did a perfect job bringing out the best in both. 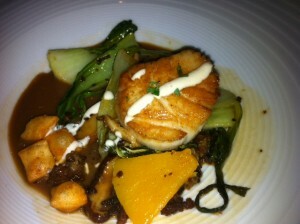 The biggest test for these lovely wine wines was the Steamed Chilean sea bass, ginger, ichimi, shitake mushrooms. Once again,The Sea bass paired with shitake mushrooms allowed the wine take on its more mineral qualities for a delicious pairing. It was now time to bring on a bigger wine and bigger dishes and the challenge to Chef Tim was not to overpower the dish or the wine. He succeeded with the Aglianico in three perfect pairings. Salmon carpaccio with black truffle, citrus sauce, Seared tuna with truffle, and foie gras and Australian Wagyu filet served toban yaki style with asparagus and Japanese mushrooms. All three dishes were food and wine pairing works of art and we experienced how the wine changed from dish to dish like a perfect symphony in tune. The Guardia 33 is a wonderful line of wines that are unique and should easily find a home on many of the finest wine lists in the country. 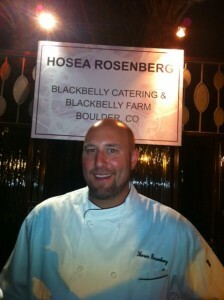 Chef Tim Horrock put the wines to the test and did a wonderful job showing off their versatility. We will seek out these wines on the list when we dine as we have been fortunate to experience them first hand, enjoying their versatility and their ability to pair well with a variety of dishes. “This is my ninth harvest in the area and it has been unlike any that I can recall,” says Executive Director for the Monterey County Vintners and Growers Association, Rhonda Motil of Monterey County’s 2011 growing season. 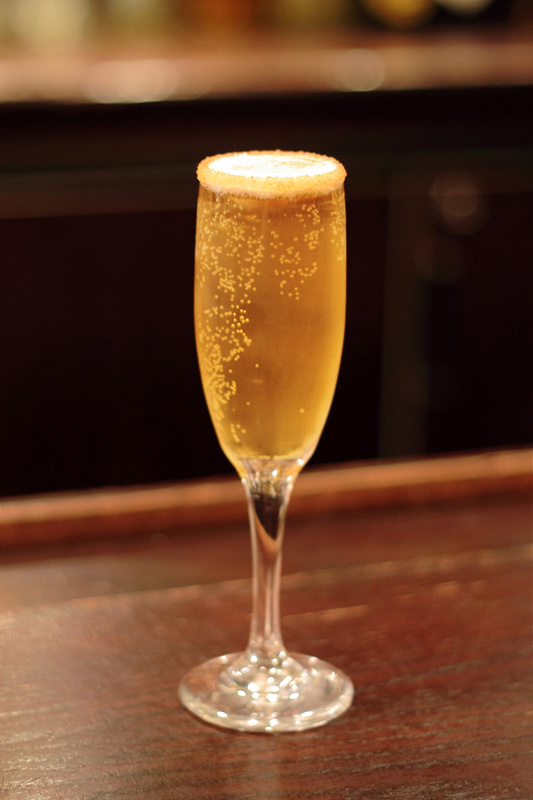 Created by Morton’s Vice President Wine & Spirits, Tylor Field and Mixologist and Certified Sommelier, Sara Fasolino. Join Us at Venetian and The Palazzo Las Vegas celebrate Thanksgiving with special menus at select restaurants and a unique, festive Thanksgiving Holiday Feast on Thursday, Nov. 24 at 4 p.m. in The Palazzo waterfall atrium gardens. Guests will sit side by side at two 30-foot picnic-style benches surrounded by magnificent décor featuring autumn leaves, bales of hay, cornucopia and traditional crops of American landscape. Executive Chef Olivier Dubreuil will prepare an exquisite feast of Thanksgiving spread served family-style while guests listen to the sounds of violinists. Featured wines include I’M, Chardonnay by Isabel Mondavi, Sonoma County 2010, Siduri, Pinot Noir and Santa Lucia Highlands “SLH” California 2010. When many people think about California who has never traveled there, they think of San Diego, LA and of course the wines of Napa and Sonoma. What they don’t know is that California is the “salad bowl “of the United States, additionally, world class wines are made from all over the state. These facts are often not mentioned or at the very least understated in their importance. 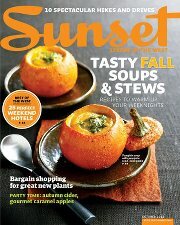 SUNSET Magazine has long since been a shining star in the Western United states showing the best the west has to offer. SUNSET Magazine held its 2 Annual SAVOR the Central Coast Event at the historic Santa Margarita Ranch located almost half way between Paso Robles and San Luis Obispo. But, by no means is this very special event held just at the Ranch but shows off the bounty of the Central Coast from Paso Robles to Pismo Beach. Guests that attend this 4 day extravaganza were joined by the Sunset Magazine Editors, Celebrity Chefs, Food Network Stars, Renowned winemakers and some of the finest food purveyors in the country as they sipped, and dined their way across the fertile valleys of these amazing areas on the Central Coast. SAVOR wastes no time in getting things started right; the first event being a Sunset VIP Reception at Hearst Castle in San Simenon. Strolling in the beautiful gardens with bubbles in hand while gazing at the Neptune Pool at Sunset is a great way to start any event. In this venue, SAVOR does it first class and the weekend was just getting started with a full day of events slated the following day. 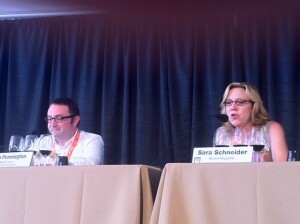 SAVOR Day 2 was all about featuring Off-Site Events. There was something for almost any interest to enjoy. Guests could choose to head to the coastal village of Cayucos and the Ocean Rose Abalone Farm that harvests sustainably raised abalone and then have a gourmet lunch with SUNSET Editor-in-Chief Katie Tamony. If Oysters are your thing, Guests could head to nearby Morro Bay and The Morro Bay Oyster Company that continues a rich tradition of Oyster farming. After a boat ride on the magnificent Morro bay, attendees could spend the afternoon by enjoying a lunch of oysters paired with San Luis County Wines along with SUNSET Associate Editor Christine Ciarmello. For guests liked to keep both feet on dry land, SAVOR had a wonderful event at the Happy Acres Goat Farm which is a working dairy run by 4 women and their families. 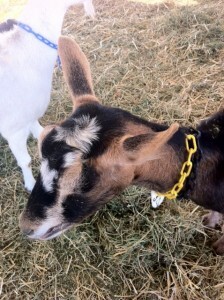 For anyone hoping for hands on experience, there was even an opportunity to milk goats and make goat cheese. Many other events Included were the Behind-the-Scenes Hearst Castle Tour and for the more outdoor adventurous, one could Kayak/Paddleboard Tour on the Morro Bay Estuary, or take a hike on the beautiful Coastline Walk with a Gourmet Lunch in in Montaña de Oro State Park after the journeys end. Ever had lunch at a lighthouse? If not, then guests could choose to Hike (or trolley up) for a Tour, and Lunch at Point San Luis Lighthouse. 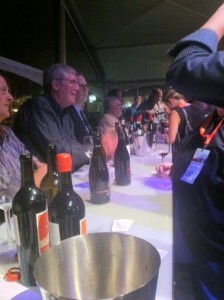 Of course there was an event for the fledging winemakers in attendance. Many guests joined Sunset Wine Editor Sara Schneider and Sunset Editor-in-Chief Katie Tamony for one of the weekend’s most anticipated events. The Sunset Western Wine Awards are recognized as the highest honor for Western winemakers and focus solely on wines produced in the West. Sunset’s panel of professional judges included Western wine writers, sommeliers, and winemakers with wines that have been nominated for a Sunset Western Wine Award. At this gala reception and awards ceremony, guests enjoyed the award-winning wines and met the award-winning winemakers as they sipped “The Best in The West “. 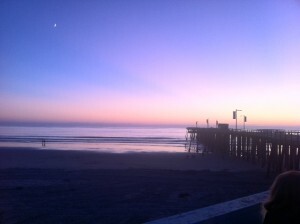 The Gala event was hosted by the City of Pismo Beach on the historic Pismo Beach pier and also featured fresh local fare hors d’oeuvres prepared by many of the best Chefs in the area. Many awards and accolades were given out to the well deserving wineries, sommeliers, and winemakers through the evening under a starlit sky. The highlight of the evening was when the Life Time Achievement award presented to Allen Shoup, a true legend in the Industry, credited for founding Washington State’s Wine Industry and shaping the nature of this outstanding wine region. What a better day could one desire than attending the morning and afternoon off site events and closing the day on the Pismo Pier at a Red Carpet Gala honoring many of the finest men and women in the Industry. Heading back along the Pacific Coast Highway with moonbeams bouncing off a flat sea we already started to smile with anticipation on what the next two days would bring. 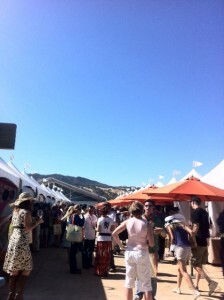 Saturday at SAVOR meant it was the first Day of “The Main Event” at the historic Santa Margarita Ranch. The Main event provides something for everybody as guests had the opportunity to ride a train around the picturesque ranch, listen to great local bands in a beer garden, drive a Lexus like you never had before around a specially designed track, and then of course try all the fantastic food, wine and live demonstrations. If you were an early riser, the event was highlighted with the opportunity to have breakfast with Editor-in Chief Katie Tamony. After breakfast renowed Chef and Author Cindy Pawlcyn gave guests an education on Sustainable Seafood that is so important to everyone in these days and times. Iron Chef, Author Cat Cora herself took the Chef Central Stage by storm as only she can with, Cat Cora’s Classics with a twist. 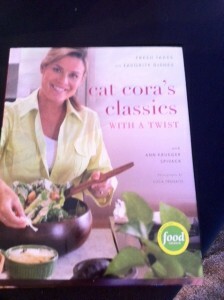 She later signed copies of her newest Cookbook of the same name for a standing room only crowd. For guests that wanted to learn about what’s happening in the world of Wine, Sara Schneider Sunset’s Wine Editor gave guests a unique look at the “crazy blends” from Paso Robles and what to expect in the future. Even though SAVOR is primarily focused on the Central Coast, Washington State Wines were on hand as the first ever “featured region “to the event. 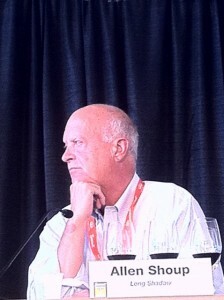 The legendary Allen Shoup , this year’s Life Time Achievement award winner, conducted a very in-depth look at Washington State wines from their beginning and looking ahead to the future of the region to a full house. Over in the Farmers Market , attendees had the opportunity to learn about a variety of topics such as 3 Ways with Fresh Figs , The Perfect Way to Chop, Dice, and Peel the Most Challenging Products ,How to Grow Your Own Gourmet Greens and of course The Perfect Tomato: Plant it, Grow it … Eat it! Just to name a few. The Sun was setting lower behind the mountains and that meant the Main Event’s first day was coming to an end, but that did not mean the day was over by any means for the guests. Two world class events awaited them in two Central Coast towns that would be a highlight of anyone’s culinary experience for the weekend. 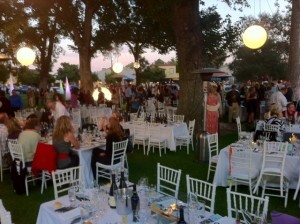 In nearby Paso Robles guests attended “Paso Glow “. Paso’s City Park was illuminated and transformed into an Intimate Gala Dinner venue complete with live music and featured the sumptuous fare of gifted local Chef Jeffery Scott from Thomas Hill Organics. With the backdrop of big band music playing, along with the glow of large lit structures, guests were treated to an illuminating food and wine experience . The final day of the Main Event was upon us but that in no means meant SAVOR was slowing down. Once again, guests were given the opportunity to start their day having breakfast with Sunset Editor-In-Chief Katie Tamony as they enjoyed the fresh, cool morning air at the Ranch. Things started heating up when Chef Anthony Hagans from Harris Ranch gave guests tips on BBQ Premium Natural Beef as well as slow cooking and preparing Beef for today’s fast paced lifestyle. For those who wanted to party with food there was a fantastic option to get their fix and have some fun in the Kitchen with the Food Network’s Aarti Sequeira. The always delightful” Arti Paarti “was in the house and treated guests by sharing her knowledge of Indian Cuisine with a twist on American classic dishes. It was 4:00pm at the Ranch and after all of those great wines and food many thought it was time for a cocktail and SAVOR did not disappoint. The best of the best Mixologists from LA and San Franciso competed against each other as they shook and stirred artisan cocktails that are all the rage amongst the finest dining venues and were also a delight to the attending guests. In the Farmers market experts were showing off local cheeses , teaching how we can all grow our own gourmet greens and giving an interesting look at growing Crops in Pots. Blind Tasting Pinot Noirs is always fun and Wine Editor Sara Schneider guided guests through a blind tasting of the regions finest Pinot Noirs in her Central Coast Pinot Noir shoot out . 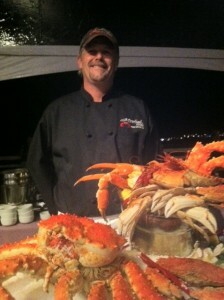 All the events provided a diverse, and delicious look at what the best of the Central Coast has to offer. SAVOR the Central Coast takes guests on a journey of Food , Wine , Mixology, Agriculture, history and travel, all over the central coast. Many guests took advantage of the four day Main Event to have “the journey” come to them. Others choose to take the journey literally. That is exactly what these journalists did. We started in Paso Robles which is actually “El Paso de Robles” which is Spanish for “The Pass of Oaks”. We learned about the “Templeton Gap “which is a notch in the Santa Lucia Mountain Range that allows the marine air inland and across to the vineyards of Paso Robles . Temperate swings of 50 degrees within a 24 hour period are not uncommon. We also learned about the abundance of Olive Orchards and world class Olive Oil made right in Paso Robles. 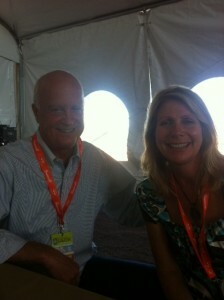 Of course many wines from Paso Robles were featured at the Main Event each day. Ecluse Wines , Kenneth Volk Vineyards , Justin Vineyards, Ortman Family Wines and Niner Wine Estates were a few of the stand outs for us. Our SAVOR exploration continued west to the town of San Luis Obispo. A Thursday night Farmers Market that closes the main street downtown for several blocks, attracts some of the finest products in the central coast and makes your palate and nose dance with excitement. San Luis Opispo is the third largest wine region in California, which is news to many who think that this is just the sleepy small college town of Cal Poly. There are over 200 wineries and 100 tasting rooms with award winning wines just minutes from downtown. We even took a foodie walking tour of the downtown area. Beginning our journey into one of California’s finest wine and food regions, we also wanted to see what makes the town San Luis Obispo the “Happiest Town in America”, according to Oprah Winfrey, and many others who happen to visit this quaint college town. We were indeed very elated after taking the San Luis Obispo Food Tasting and Cultural Walking Tour which demonstrated why SLO is such a great place to live, work and play. How does one really get to know the heartbeat of a community? Look at the food venues and the history that surrounds the community. The tours offer “the best examples of Central California cuisine , culture, architecture and little known stories of the city’s history, “ according to their website: CentralCoastFoodTours.com The tours are approximately 2-3 hours of moderate walking and is open to most people in good health. By taking time to walk around the town of SLO, escorted by our effervescent and long time resident, Jules, we had the privilege of learning the history and the nature of the town and the people that create the community. Meeting our guide on the steps of the historic Garden Inn, we were given a brief history of the hotel and its colorful owner. We then moved on to one of the local’s favorite bars in the area, Black Sheep Bar and Grill whose authentic replica of a European bar, and fantastic mac-n-cheese along with other local fare, keeps this venue as one of the local’s favorite watering holes. The bar and outdoor patio offer a casual dining experience where locals love to gather. 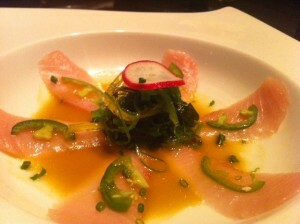 The food served at the restaurant captures the fresh local ingredients. We had their signature sumptuous mac-n-cheese dish, which incorporated local cheeses and herbs. This was served outside in a delightful garden patio, where Jules told us the history of the restaurant and some local lore. After leaving our pleasant surroundings, we headed on to one of the best local sources for all things olive oil. We Olive is a local store that offers some of the best olive oils from the county and around the world. We were able to do an olive oil tasting which is similar to a wine tasting on some levels. Each small cup of oil we tasted was to be sniffed, swirled and savored for its aromatic and unique qualities. Whether it’s flavored oil you are looking or an extra virgin olive oil, We Olive is the place to visit in SLO. There are also other We Olive outlets throughout the county for your shopping pleasure. Onto our next stop; Buona Tavola, a northern Italian cuisine restaurant. Having eaten at this local restaurant in times past we knew whatever the chef had ready for us was going to be delightful and we were not disappointed. 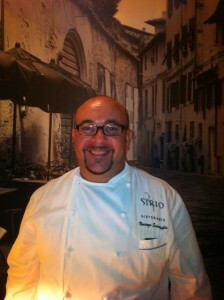 Chef-owner, Antonia Varia and his staff deliver marvelous northern Italian culinary delights. 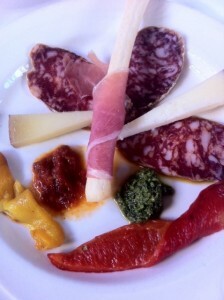 This time we were treated to a plate of Chef’s new venture, homemade salami. This handcrafted Italian salami is created with only the finest natural ingredients. The name of the new venture is Allesina Handcrafted Italian salami and is named after Chef’s deceased Mother as a tribute to her and the tradition of making salami each winter for the entire family. This product is indeed made with love and was served with several different cheeses. The salami was chewy and mother-watering savory. We enjoyed each bite. We then moved onto nearby Edna valley which was predominately featured each day at the Main Event at the Santa Margarita Ranch and rightfully so. They have incredible wines in this understated region. Ancient Peaks Winery, Chamisal Vineyards, Claiborne and Churchill Winery, Kynsi Winery and Salisbury Vineyards really caught our attention. Still heading west, we embarked upon the bountiful Pacific Ocean. Arriving to the coast and experiencing the sea food bounty of Morro Bay, the quaint city of Pismo Beach, we realized what a wonderful experience to be had in just a few short days. SUNSET Magazine and its SAVOR the Central Coast is really about a journey of experience, condensed into a fantastic four day timeframe. Sunset Magazine provides an enjoyable experience incorporating each area of the central coast not only for what they uniquely provide but what they supply together in the fertile ground of California. 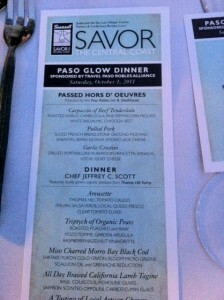 SAVOR the Central Coast is one of SUNSET Magazines premier events and nobody has ever done it better. 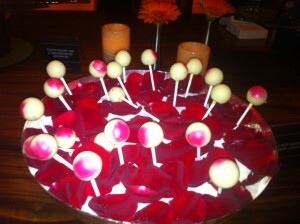 We look forward to seeing what surprises the 3rd annualSAVOR the Central Coast will have to offer.